Are you having trouble regulating your literature monitoring process? 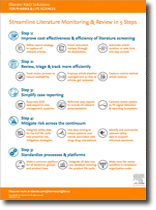 Simplify and standardize your case reporting: Take a look at these 5 simple steps to streamline your literature monitoring to make your process more cost effective and efficient. Read the full white paper on Rethinking literature monitoring and review.